We’re on the verge of that very season that once saw the streets of Mumbai filled with more people than cars on the roads. 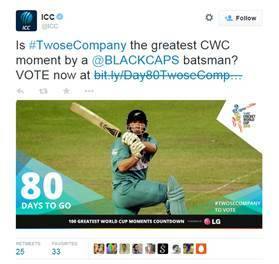 An instance almost 4 years ago – the ICC Cricket World Cup. 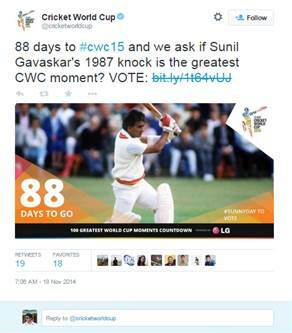 As we now stand less than a 100 days away from this religious event for the nation and world around the ICC and Cricketing world cup fraternity thought of exploiting social media in a unique way to pull in those few souls left that don’t watch the game. The objective of this campaign was to tell people it’s time for the biggest Cricketing sensation to hit the world, The ICC Cricket World Cup and then live up to the heritage that the World cup has built up over the decades. It was done through the mode the Australian and New Zealand legends. Moreover the use of these country specific stars was strategically aimed at telling the world where the World cup is going to take place this season. The objective was also to get people to already know where to tune into when the World cup season is about to begin. This could also be seen as a strategy to pull in people much before the WC even begins as Cricket fans would love to know and see the build towards the World Cup. 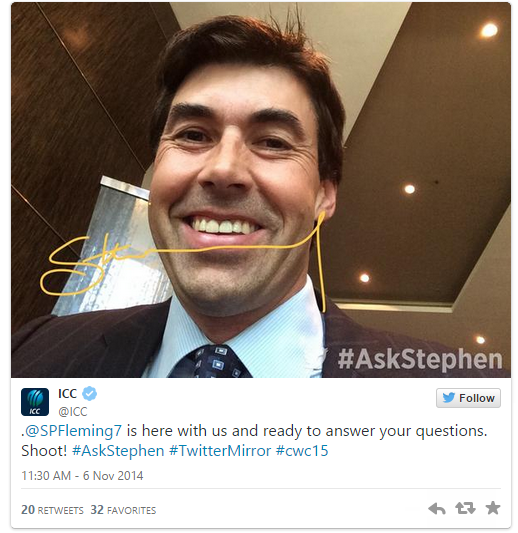 A Twitter QnA took place where followers were asked to question Stephen Fleming. This took place only on Twitter and was right in the middle of the day where a lot of tweets poured in. he answered questions from the toughest bowler he’s faced to his pick for the World Cup winners in 2015. Another interactive attempt to engage fans was using Twitter Vines that had snippets of the offline activity in Australia. These vines elaborate what the event was like on the given day in Australia and attempted to interact with the audience through an even more attractive way. There also was a good amount of Video content leading up to the D-Day with the integration of Twitter Video Card to bring 1 click play to fans on Twitter. With a few 6 second teasers like this. And full-fledged videos that show the excitement that’s already mounting up in the Australian camps. This was another phenomenon that took ground at the launch event. 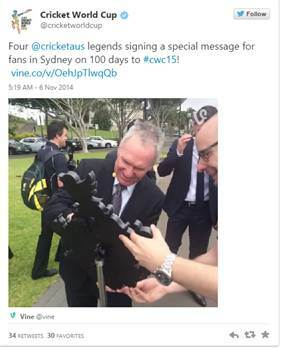 In order to tell fans this is what’s in store for them a black mirror was installed that went around being signed by the biggies of the Australian cricket world. This is the highlight of the entire campaign where a 100 day campaign was inaugurated. 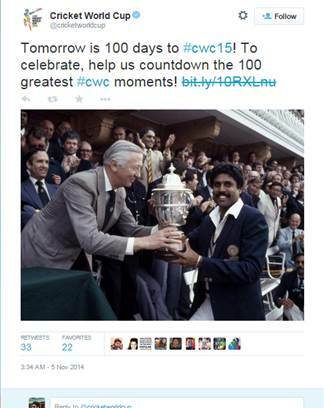 If the world had 100 happy days, Cricket had 100 Greatest Moments of the Cricket World Cup. Starting on T – 100 (read as T minus 100) till the day of the world cup everyday an image goes up from the history of the World Cup. This is then up for vote where the 10 most popular moments will be accounted for and the best moment amongst those wins the crown. The everyday activity is also coupled with a lot of trivia pertaining to the WorldCup and Cricket in general. The Tweet Stream is also filled with images which makes interactions much more easier. 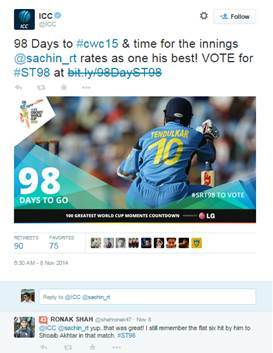 The campaign stuck to one platform and utilized it in every way possible. 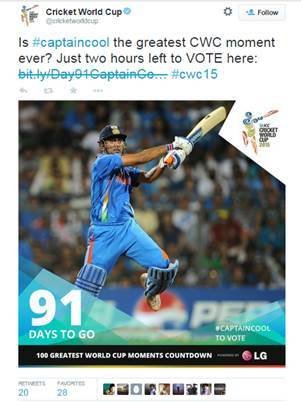 It had contests, videos, vines, unique elements like the Twitter Mirror, voting and images all imbibed into a holistic Twitter driven campaign. Playing on the history was a good move as moments in Cricket in India are dearly remembered and have memories that the fans can easily connect to, so good thinking on that front. Another positive is the build and the videos did complete justice to creating that nail-biting start. 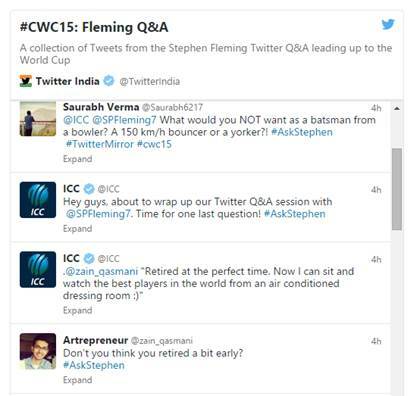 With regards to Twitter, personally ICC has struck right where it has to and managed to garner a good following with a build to the world cup. What could have been incorporated is Facebook and Instagram. 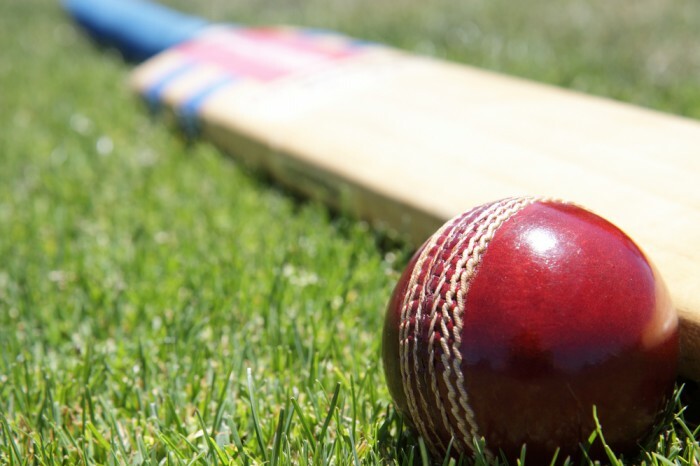 A Facebook app, with so much on the cricketing grounds could be incorporated. Even an Instagram campaign or posts pertaining to the game building towards it could pull in people pre-dominantly on that space too. The season is just 2.5 months away from beginning, there’s definitely going to be a lot that will be revolving around this and a lot to look forward to. Keep an eye on what’s going to happen here. Speculation states there’s going to be a lot of chatter that’ll be going about in this area. Are you geared up for the season? We sure are! How will CEM/CRM Evolve with Technology in India over the Next Few Years?